We are among the acclaimed names in the industry for manufacturing and supplying Industrial Wet Scrubber. From the first day of our inception, we export, manufacture and supply the premium quality of Wet Scrubbers. The rendered wet scrubbers are ideal for controlling and curbing the toxic fumes from different industrial applications. 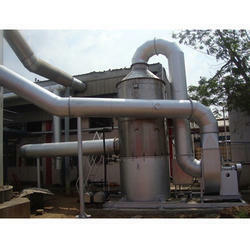 These wet scrubbers can be customized as per the specifications provided by the patrons. As a customer-focused organization, we are providing a wide array Wet Dry Scrubbers. Pullman Engineering Systems Pvt. Ltd.
We have gained rich industry experience in this domain for offering a wide array of Industrial Wet Scrubber to our valued clients. These products are made from high quality input factors. we have designed & installed most efficient venturi wet scrubber which effectively arrests 100% particles of sizes up to 10 micron & bring down the final exhaust emission level within 125 mg / nm.